Protesters gather Friday in North Texas, where Dallas County Judge Clay Jenkins has spearheaded a plan to house 2,000 undocumented children amid the border crisis. 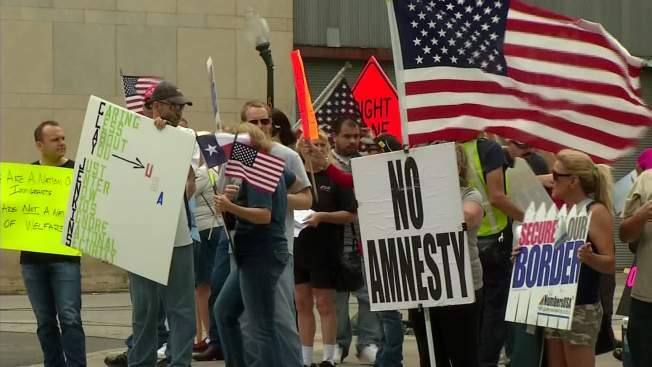 The leaders of some of the groups coordinating rallies against undocumented immigrants this weekend are Tea Party backers with histories of colorful, and sometimes controversial, tactics protesting the Obama administration. Critics of the recent surge in children crossing the U.S.-Mexico border, and of plans to house them, are protesting nationwide Friday and Saturday, on highway overpasses, in state capitals and at Mexican consulates. Three groups — the Americans for Legal Immigration PAC, Overpasses for America and Make Them Listen — are coordinating the demonstrations, protesting what they call President Barack Obama’s refusal to enforce immigration law. William Gheen, the president of Americans for Legal Immigration, describes himself as a veteran campaign consultant who has fought illegal immigration for a decade. He says he previously worked for North Carolina's state government as a legislative assistant and on the Senate sergeant-at-arms staff. More recently, Gheen and his group have attracted attention, and their share of criticism, over the years for their colorful activist tactics and public remarks. Gheen once organized a campaign urging supporters to send used underwear to Obama and to House Speaker John Boehner, in mocking response to a call by Immigration and Customs Enforcement for new underwear for detained immigrants. He has also said his group decided to call Obama "Dictator Barack Obama." But critics say that Gheen overstates his group’s influence and that Americans for Legal Immigration is essentially a one-man show. He has come under fire for the distribution of the donations made to his group. According to OpenSecrets.org, which tracks money in politics, the group has spent $1,904 against Republicans, including South Carolina's Republican Sen. Lindsey Graham, in primaries for the 2014 midterm elections and has spent no money campaigning for Republicans or Democrats — at the same time Gheen was taking a $69,379 salary. Gheen has also been criticized for saying at a rally that Graham was gay and for urging him to come out, ostensibly so his sexual orientation would not be used against him. Graham has long denied suggestions that he is gay. Now, amid the undocumented immigration protests Gheen's group is helping to organize, much of the group's criticism is aimed at Obama, whom Gheen blames for the surge in immigration by thousands of undocumented children from central America. "We’re hoping to raise awareness about the Obama-inspired illegal immigrant surge at our southern border," Gheen said of the rallies. He accused Obama of trying to transfer the immigrants to shelters around the country as a means of lessening the chances they might be deported, and he said the undocumented children's age should not affect how they are treated. Organizing the protests alongside Americans for Legal Immigration is Overpasses for America, a Tea Party-affiliated group that encourages demonstrators to protest on highway overpasses to capture drivers' attention. The group's founder, James Neighbors, said that undocumented immigrants should be quarantined because they might have communicable diseases like tuberculosis or hepatitis C, a charge critics say is unfounded. Neighbors is no stranger to protests on overpasses. He previously organized the group Overpasses for Obama’s Impeachment, which encouraged Obama’s critics to take their protest signs to overpasses. He was inspired to form that group, he explained, by the attack on the U.S. diplomatic mission in Benghazi. Last year, some of that group’s leadership resigned after accusing him of using money donated to the group for personal use — accusations Neighbors says are lies. Neighbors said he borrowed money that had been donated specifically for his use while he was in the midst of a workman’s compensation dispute. A former Oklahoma corrections officer, he was injured while protecting a coworker during a fight between inmates, he said. To critics like Henry Fernandez, a senior fellow at the progressive think tank the Center for American Progress, Neighbors' affiliation, based in Washington D.C., with impeachment efforts show how fringe his anti-immigration effort is. Fernandez said he didn't expect the immigration protests to draw many people in most places. One of the organizations, Overpasses For America, pushes "this broad range of conspiracy theories, where the government is trying to take the country away and rights away from real Americans, whatever that might be," he said. And all three are small groups on the fringe, he said.